You are here: Home / Skincare / Aromatherapy/Essential Oils / Essential Oil of the Month: Fennel! Essential Oil of the Month: Fennel! 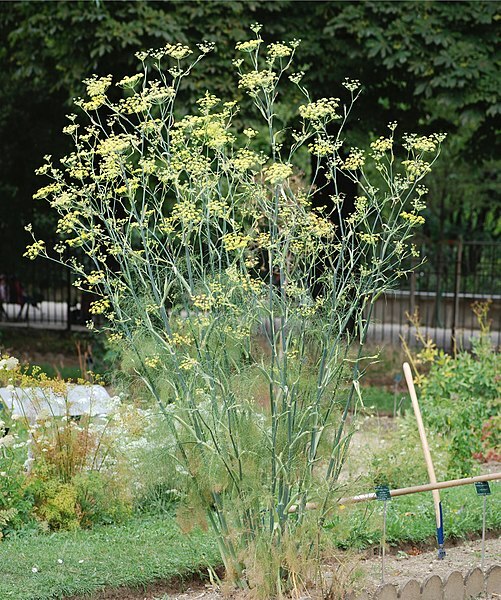 Fennel (Foeniculum vulgare) it is a hardy, perennial, umbelliferous herb, with yellow flowers and feathery leaves. It is indigenous to the shores of the Mediterranean, but has become widely naturalized in many parts of the world, especially on dry soils near the sea-coast and on riverbanks. It is a highly aromatic and flavorful herb with culinary and medicinal uses, and, along with the similar-tasting anise, is one of the primary ingredients of absinthe. Florence fennel or finocchio is a selection with a swollen, bulb-like stem base that is used as a vegetable. In Greek mythology, Prometheus used the stalk of a fennel plant to steal fire from the gods. Also, it was from the giant fennel, Ferula communis, that the Bacchanalian wands of the god Dionysus and his followers were said to have come. Fennel contains anethole, which can explain some of its medical effects: may stimulate estrogen production and increase lactation; due to its phytoestrogens. As well as act as a stimulant to the circulatory and digestive systems. It may also act to break up and flush out toxins, cleansing the tissues. The essential oil acts as an antiseptic, antispasmodic, carminative, depurative, diuretic, emmenagogue, expectorant, galactagogue, laxative, stimulant, stomachic, splenic, and vermifuge. Also thought to help with courage. Blends Well With: Bergamot, black pepper, cardamom, cypress, dill, fir, geranium, ginger, grapefruit, juniper, lavender, lemon, mandarin, marjoram, niaouli, orange, pine, ravensara, rose, rosemary, sandalwood, tangerine, and ylang ylang. Gently rub stomach with oil blend in a clockwise (not counterclockwise) motion to help peristalsis. Essential Oil should not be applied directly to the skin but in carrier oils, putting the oils directly on the skin is too harsh due to their concentrated form. Add a few drops of fennel oil to the carrier oil.